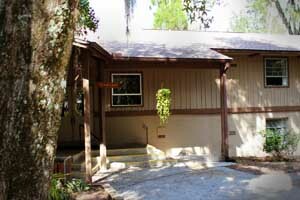 Cedarkirk features a wide variety of accommodations for guest group lodging. Housing can vary according to your particular group needs. From dormitory style to rustic, Cedarkirk aims to meet your comfort level during your stay. Climate controlled facilities include 150 beds in two lodges, cabins, a retreat house, and a cottage. 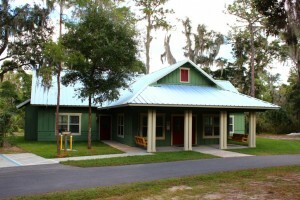 Rustic facilities offered include over 100 beds in cabins, platform tents, and camping areas. We also offer a variety of indoor and outdoor meeting spaces. These spaces range from indoor areas for 100 to outdoor spaces for up to 250 people. Floor plans and pictures are available below. Cedar Lodge: This central lodge at Cedarkirk is the location of the main offices, 2 dining rooms/meeting rooms, upper and lower back porches, and a library. In addition, there are four wings of housing accommodations including both family-style and dormitory-style rooms. Pine Lodge: This lodge provides a variety of housing including four family-style rooms for 6 people each and 13 dormitory-style rooms upstairs. This building also features upper and lower porches, kitchen facilities, meeting room, and a fireplace. Retreat House: With five bedrooms, full kitchen facilities, screened porch, and a large meeting room, this newly renovated house provides the perfect retreat setting for smaller groups. Hickory Cottage: Our brand new building features a large central meeting area, two group-style rooms that sleep 10 people each, and two private bedrooms upstairs with queen beds and their own bathrooms. This building is nicely appointed and is fully air-conditioned and heated. Kirk Kabins: These two identical cabins feature a large room sleeping 9, a small sitting area, and bathroom. While these cabins might seem rustic out in the woods, each cabin features vaulted ceilings, beautiful wood paneling and flooring, and AC. Pavilion: This indoor/outdoor meeting space is centrally located and features an indoor, climate-controlled meeting room with seating for 40 in chairs (fewer with conference-style tables). 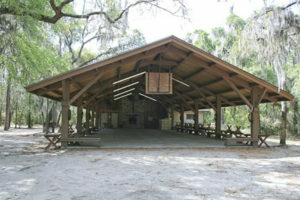 The covered, outdoor area is used for line dances, basketball, games, and can seat more than 100 on benches and chairs. Rustic Cabins: Clustered into villages of two, these screened cabins provide sleeping for 8 and feature electricity and fans. 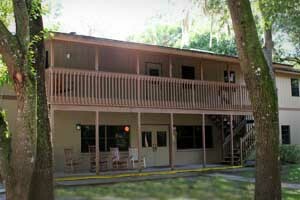 This lodging option offers the rustic feel of camping with the luxury of a cabin. There are nearby bath houses for all rustic cabins. RV/Tent Sites: We have five RV/Campground sites with electric, water, and sewer hook ups. There is also a nearby bath house.